Sings the Ballads of the True West is Cash's legendary 1965 concept album of cowboy songs. Now with twenty-two tracks, thanks to the addition of "Rodeo Hand" and "Stampede (Alternate Instrumental)", the historical country album finds Cash's baritone retelling the stories of migrating out West and living the life of a cowboy. The outlaws, the gunfights, and the folks that harvested the land to make it livable, they're all here in one song or another. "The Road To Kaintuck", "Mister Garfield", "Johnny Reb", "25 Minutes To Go", and "A Letter From Home" are just a few of the tracks on the album that demonstrate Cash's gift for storytelling. 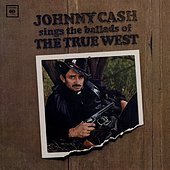 If there ever was a believable collection of songs about living the cowboy lifestyle, Cash's Sings the Ballads of the True West is that album, a well-researched, reliable, and often fictions, though entertaining recounting of the West's growth from prairie to a heavily settled area. I'll give it an A+.